Coconut Caramel Cake – Not Quite German! This is a “German Chocolate Cake,” but instead of the layers of chocolate cake I used a coconut sponge. For the longest time I thought the original version was invented in Germany, hence the name. But, it was actually discovered in Dallas, Texas around 1957. A woman shared the recipe with a local newspaper and it became an instant success. The mystery doesn’t end there, because the cake wasn’t named for her either. Her recipe called for “German’s Baking Chocolate” from the Baker’s Chocolate Company. The name of the cake gave credit to Sam German, who created the chocolate. Eventually the possessive apostrophe was dropped from the name, and all the confusion began. 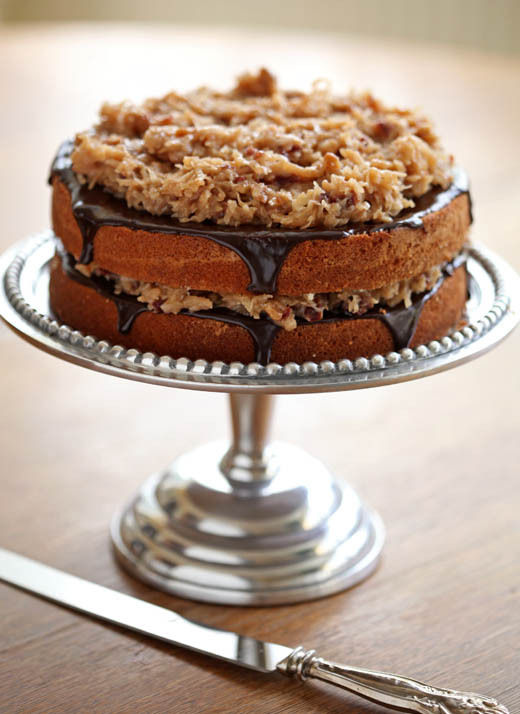 The sticky, gooey, caramel-coconut topping is rich and filled with pecans. Traditionally the cake was served topped with maraschino cherries, but I use chopped dried cherries in the coconut filling instead. The bittersweet chocolate ganache between the layers gives this cake a distinct “Almond Joy” candy flavor. 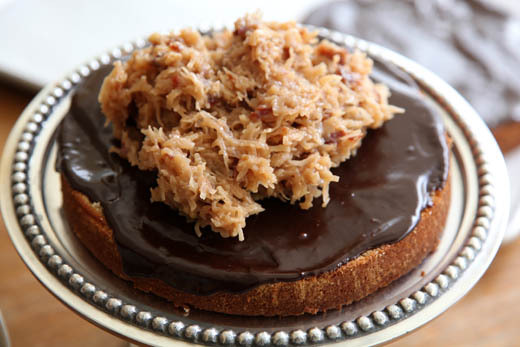 If you are a traditionalist you should try this with my dark devil’s food cake, it is not the same as the milk chocolate “German’s Chocolate Cake” recipe, it’s BETTER! preheat oven to 350 degrees with rack in middle of the oven. Grease and line with parchment two 9×3-inch Cake Pans . In a medium bowl whisk together the flour, baking powder and salt, set aside. Mix the coconut milk and vanilla, set aside. In a stand mixer fitted with a paddle attachment, beat the butter and sugar on medium-high speed until light and fluffy, about 4 minutes. (Scrape down the bowl if you don’t have one of these special Beater Blade , which is my favorite new kitchen tool!) Add the eggs one at a time and beat well after each addition. Add 1/3 of the flour mixture and mix on low speed until incorporated. Add half the coconut milk and mix thoroughly. Continue to add the flour and coconut alternately, ending with flour. Add sour cream and mix until incorporated. Set aside in a large bowl if you don’t have a spare bowl for your mixer. Beat the egg whites in your stand mixer with the whisk attachment. (If you are using the same Bowl be sure it is VERY CLEAN or the whites will not whip up. Any fat on the bowl will prevent the whites from foaming.) Beat the whites on high speed for 2-3 minutes, until it forms soft peaks. Don’t over due it or the whites will get too stiff and not fold into the batter smoothly. Whites beaten without sugar will get too stiff quickly so check them after 2 minutes. Stir 1/3 of the egg whites into the cake batter to lighten it. Gently fold the remaining whites into the batter. Divide evenly in the prepared pans. Bake for about 25-30 minutes or until the tester comes out clean. Cool on rack in pan and then invert to use. In a medium sized pot heat the cream until just steaming, but not boiling. Turn off the heat and add the chocolate and butter. Gently shake the pot to make sure all the chocolate is submerged in the hot cream and allow to sit for about 3 minutes. 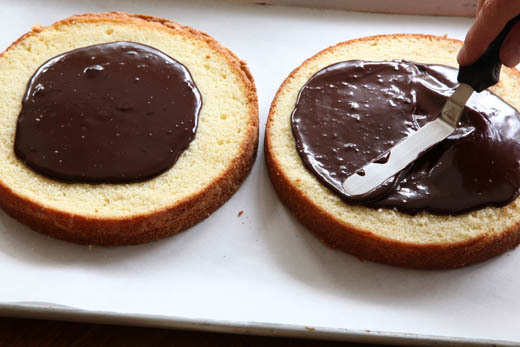 Add the rum and gently stir the ganache until it is completely smooth. 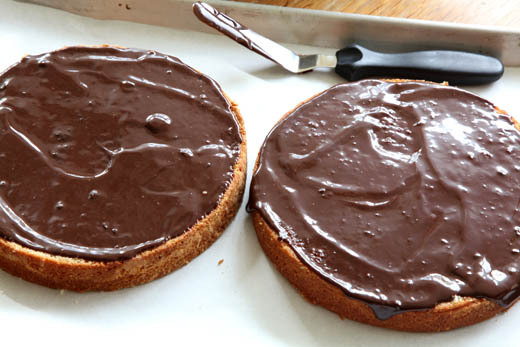 Let the ganache sit to thicken for about 15+ minutes. Once the cake is cool, trim the top to expose the soft crumb and to flatten any doming. Pour the ganche evenly over the two cakes. And spread it out so it just barely drips over the sides, you don’t want too much of it to run off the sides. Melt the butter, sugar, evaporated milk, and salt in a saucepan until smooth, cook about 3 minutes. All of the sugar should be melted. The best way to test this is to rub some of the mixture between your fingers. Turn off the heat and add the coconut, pecans and dried cherries. Place one layer of cake on a serving platter and top with half the coconut mixture. Repeat with the other layer of cake and the rest of the coconut. Enjoy! Coconut cream cake sounds dreamy, Zoë! Wish I had a slice now. I love all your cakes! This one is almost as yummy as the carrot cake you make. You make even things I don’t even like (i.e., nuts and coconut) look amazing. Wow. Recipes can not be copyrighted, but it is standard courtesy to change a few things about the recipe and say that your version was inspired by the original. Photographs, on the other hand can be copyrighted and you need to seek permission before using someone else’s photos. Sounds dreamy indeed! And I love the cake pedestal. How beautiful! When I saw the title I was puzzled because I live in Germany, and latough there is no shortage of delicious cakes here, this one did not look like something I have met before. I really enjoyed reading the history behind the name. I’m not a fan of coconut in general but I bet it works really well here, because of the slightly bitter caramel note to offset it. This is my brother’s favorite cake — I think I will have to make it for him in the near future (and eat some myself, of course)! That is a truly stunning cake! I’ll bet it tastes as delicious as it looks! Thank you for sharing this beautiful cake! I’ve got to save this for the next special occasion at our house! sounds like a yummy recipe to try. to deal with nut allergies, what would you suggest as a substitution for pecans? You can simply leave them out or replace with other dried fruit. If you leave them out, add more coconut. You could even add shaved chocolate, but that will change the color of the icing! Just a quick question. Since my oven is small and accommodates only one cake tin at a time is it advisable to make the entire batter at once and then keep one tin waiting while the other bakes? Does the waiting period affect the rise of the second cake since recipe calls for baking powder. Would this hold true for any cake with baking powder and/or baking soda? I have had great success baking in multiple batches with other cakes, but have never tried it with this one. I think you will still get plenty of rise even if the batter has to sit for a while. I can imagine how good this must be especially since you mentioned it was like an Almond Joy! I had never heard the origin of this cake – that is very interesting (I too thought it was German in origin). Your version looks amazing! Your recipes sound wonderful and I have been wanting to try the carrot cake and now this one also. However when u speak of dried cherries in that recipe and also this one, what kind of cherries are you speaking of? There are several of the dried fruit variety….thanx! Did you use sweet or tart dried cherries in this recipe. Throwing “friend” birthday parties for my sweet children is not my thing. Instead, we always have a family celebration and I bake whatever kind of cake the birthday girl/boy desires. My almost eleven year old daughter seems to have a sophisticated palate and each successive year her cake request reflects her growing appreciation for delicious food. This year she asked for something with coconut, pecans, chocolate, and caramel. 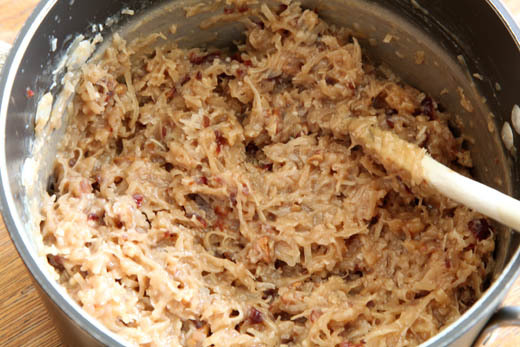 I immediately started searching for German chocolate cake recipes, yet none seem to fit the bill. 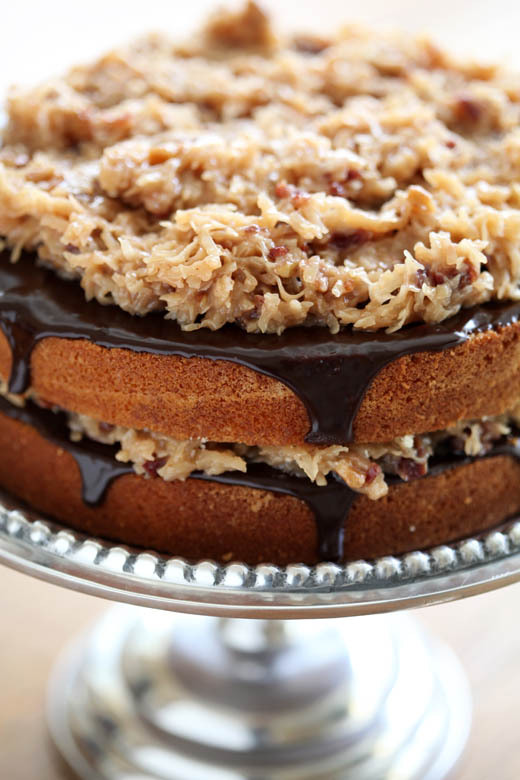 Then I stumbled on your coconut caramel cake–PERFECTION! Here’s my dilemma–I need to make this one gluten free. Can you help point me in the right direction?! Thanks so much!